Get VIP access to 2 of Madrid's most iconic establishments: the Prado Museum and Botin, the oldest restaurant in the world! Skip the line at Spain's foremost art museum. Spend 1.5 hours with an expert guide discovering the most breathtaking works of art in the sprawling Prado Museum. Learn the stories of intrigue, shipwreck, love, loss and power that surround the masterpieces. Then walk the streets of the Literary Quarter where many of the artists lived and worked as you head to a century-old tapas bar for a mid-afternoon aperitif on your way to the world's oldest restaurant. Slip past the crowds and into Botin, named the oldest restaurant in the world by the Guinness Book of World Records, before it opens for an exclusive tour of the nearly 300-year-old restaurant. Peek into its secret tunnels, meet the chefs and see the original ovens before sitting down to a hearty 3-course lunch of Botin's specialties paired with flowing Spanish wine, just like Hemingway did! Discover the dramatic history and rich culture of Spain through two of Madrid’s most famous institutions: the Prado Museum and the Sobrino de Botín restaurant, named by the Guinness Book of World Records as the oldest restaurant in the world! Head straight to the must-see paintings at Prado Museum (no waiting in line required!) as you discover the dramatic history of Spain through art in a fascinating and succinct 1.5 hour tour. The characters, artists and events that made these works possible will come alive as you make visit approximately 20 of the most famous artworks. You'll see works by masters like Velazquez, Goya, Bosch and Titian, and gain a firm footing to appreciate and understand each masterpiece. Then, after a morning the in the museum, make your way to Madrid’s gorgeous Literary Quarter and see remnants of Spain’s Golden Age. Stroll the streets that were frequented by Spain’s literary greats before diving into a century-old tavern for a traditional Madrid aperitif. Thirst quenched, head to the oldest restaurant in the world for a leisurely lunch complete with slow-roasted pork and red Rioja wine! 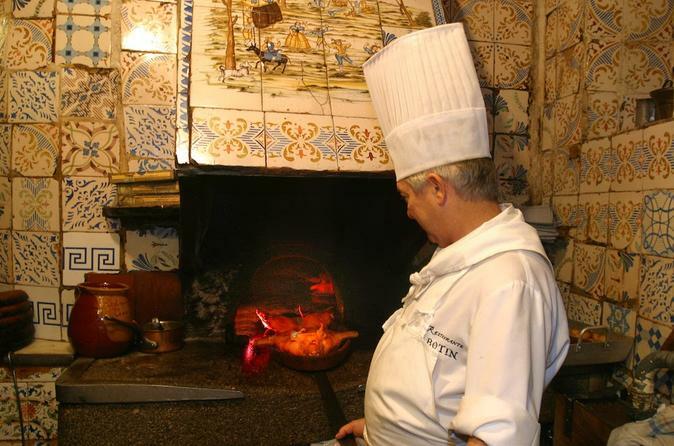 Demystify the living history inside Botin, from its escape tunnels to the table still reserved for writer Ernest Hemingway, before tasting the roasted house specialty from the nearly 300+ year old ovens. You'll dine as Goya, F. Scott Fitzgerald, the Kings of Spain and others did!